I read this article and found it very interesting, thought it might be something for you. 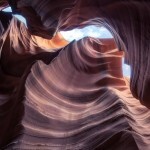 The article is called Plan your visit to Antelope Canyon – All the information and tips you need to know and is located at https://capturetheatlas.com/visit-antelope-canyon/. We had been dreaming about visiting Antelope Canyon in Arizona USA for a long time. Having seen these reddish, water-carved curves hundreds of times, we could not stop imagining the infinite possibilities for photography. The only issue at the time was that we weren’t sure where Antelope Canyon was on a map. 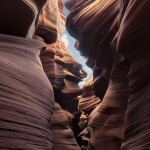 Once we discovered that Antelope Canyon is located Page, in northern Arizona, our West Coast travel itinerary was clear. Not only was it one of the top destinations of our trip, but it also happened to be on the way to a few other spots on our West Coast America visit and photography bucket list. You can find a map with the locations of Antelope Canyon, other US National Parks, and surrounding points of interest here. As noted, the Arizonan Antelope Canyon will not be like what you see in images, since there will be dozens of tourists behind you trying to take the same photo. 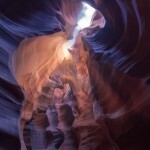 Nonetheless, Antelope Canyon is worth it, and we will help you find these pictures that you have long dreamed about. Lower or Upper Antelope Canyon? : Decide which canyon you would like to visit. 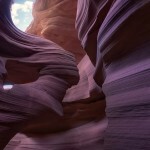 Best time to visit Antelope Canyon: Travel (if possible) during summertime. 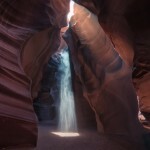 Book an Antelope Canyon Tour: It is essential to book a tour in advance. 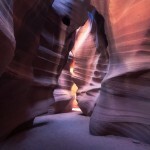 Travel to Antelope Canyon: Below we explain how to get to Antelope Canyon. 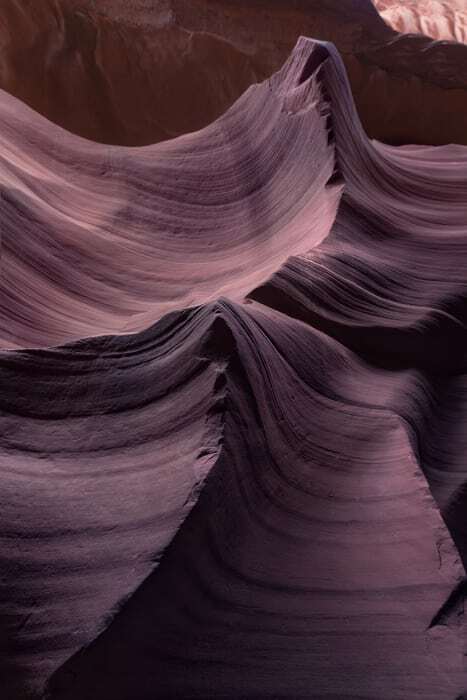 Prepare your camera / smartphone: Get your equipment ready to photograph Antelope Canyon. 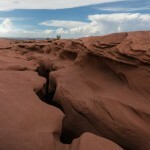 Enjoy your visit to Antelope Canyon: Follow the Navajo guide tips. 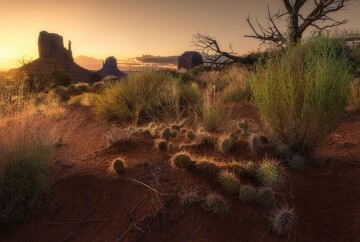 Antelope Canyon surroundings: Enjoy other wonders near Antelope Canyon like Horseshoe Bend. One of the main things we need to figure out before visiting the Antelope Canyon in the US is getting there. In this section. We will show you different options in this section. Las Vegas’s airport is the closest one to Antelope Canyon. 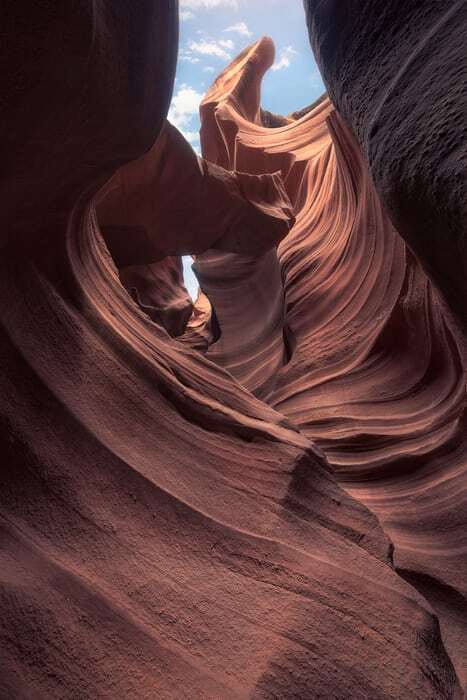 To get there, a popular option is to book an Antelope Canyon tour from Las Vegas. 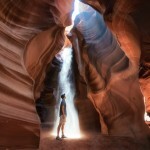 There are agencies that offer 1-day Antelope Canyon tours from Las Vegas. If you prefer to visit Antelope Canyon on your own, you must have a rental car. This is the option that we liked most since it allows you to visit Antelope Canyon your own way while being able to explore the surroundings. It takes a total of four and a half hours to drive the 279 miles of distance between Antelope Canyon and Las Vegas. In any case, if you decide to take the tour option, make sure it is an Antelope Canyon and Horseshoe Bend tour. The distance between Antelope Canyon and Monument Valley is 124 miles, so it is not out of the ordinary to visit both places on the same trip. If you plan to visit Antelope Canyon and Monument Valley in one day, I advise taking the Antelope Canyon Tour during the middle of the day and then enjoy a sunrise or sunset in Monument Valley, as those are the best hours of lighting for each place. 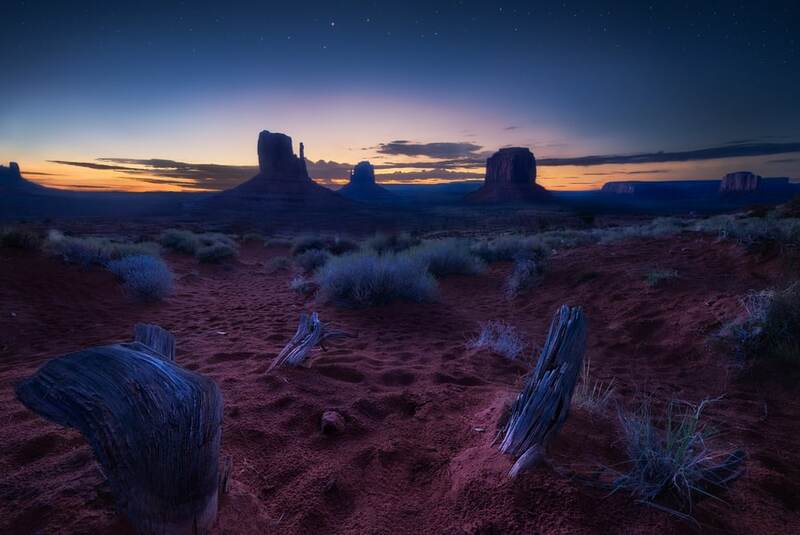 As we mentioned in our guide to visiting Monument Valley, although both places are located in Arizona and only three hours apart, they observe different time zones during the summer. Keep this in mind especially when planning your Antelope Canyon Tour so you are not late and miss it. You can find all information about time zones in Arizona here. 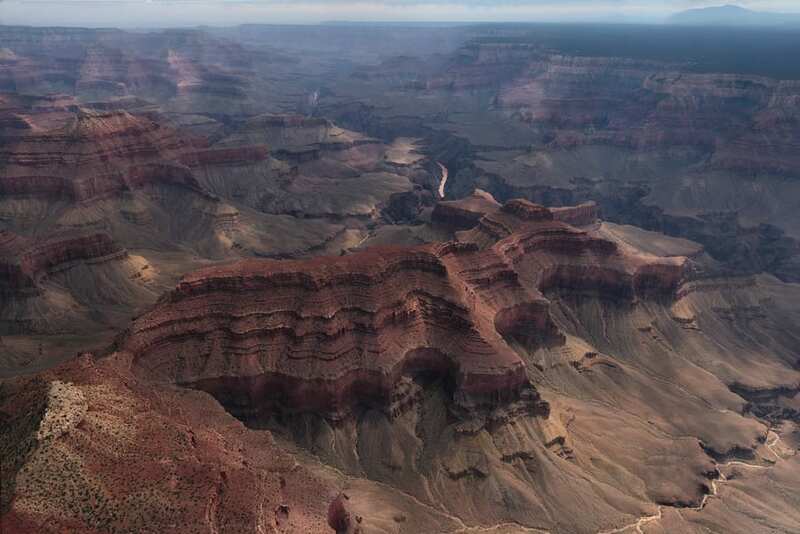 The Grand Canyon is one of the most visited National Parks in the United States. The distance between Grand Canyon and Antelope Canyon is 124 miles, which takes about two and a half hours. Although I generally recommend a longer visit, another combination to consider would be a 1-day Grand Canyon and Antelope Canyon tour. Similar to Antelope Canyon and Monument Valley, I would see the Grand Canyon at sunrise and sunset and do the Antelope Canyon tour during the middle of the day. There are two other National Parks that are relatively close to Antelope Canyon – Zion National Park and Bryce Canyon National Park. From Zion to Antelope Canyon is a 100 miles journey that takes about two hours. From Bryce Canyon to Antelope Canyon, it takes about 3 hours traveling 149 miles. 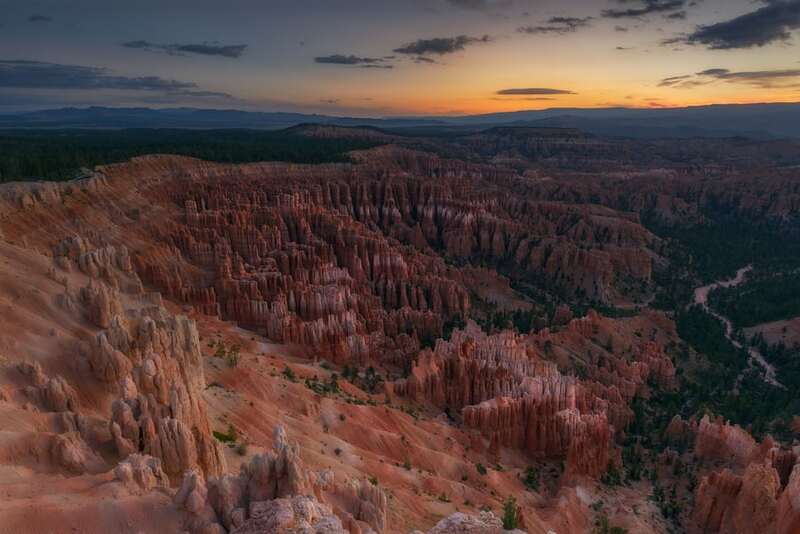 You can also check out our Guide to Bryce National Park and Guide to Zion National Park, with our recommendation and photography tips for your visit. 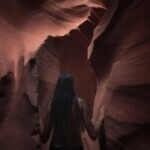 Regardless of what way you take to the Antelope Canyon, it is a worthy visit it. 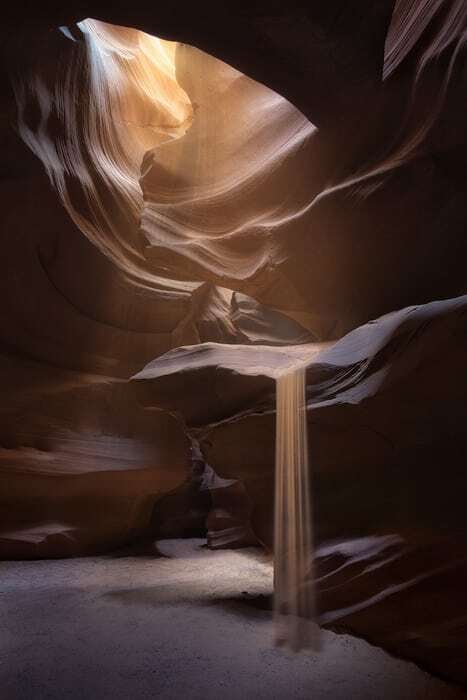 If you have the option of deciding when to visit Antelope Canyon, I recommend you do it at midday when more light enters the canyon, since that is the time when we can see more colors and take the best images of Antelope Canyon. 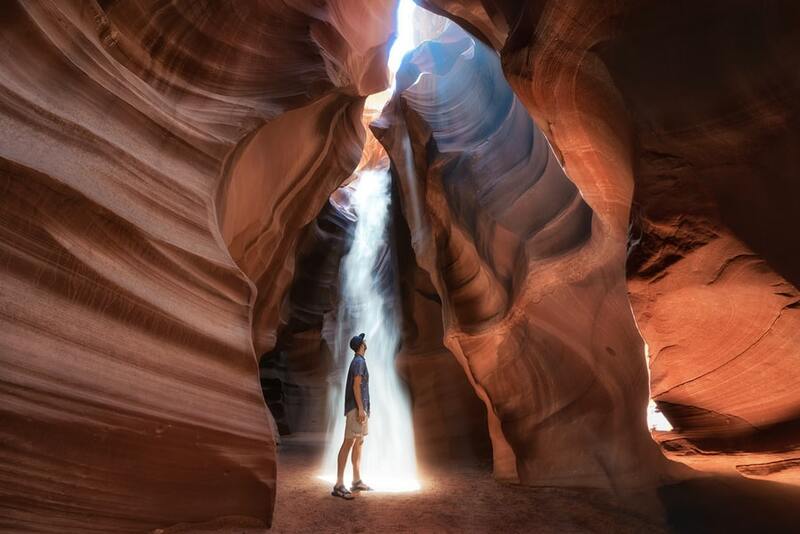 Best time to visit Antelope Canyon to see light beams: From the end of March to the beginning of October. 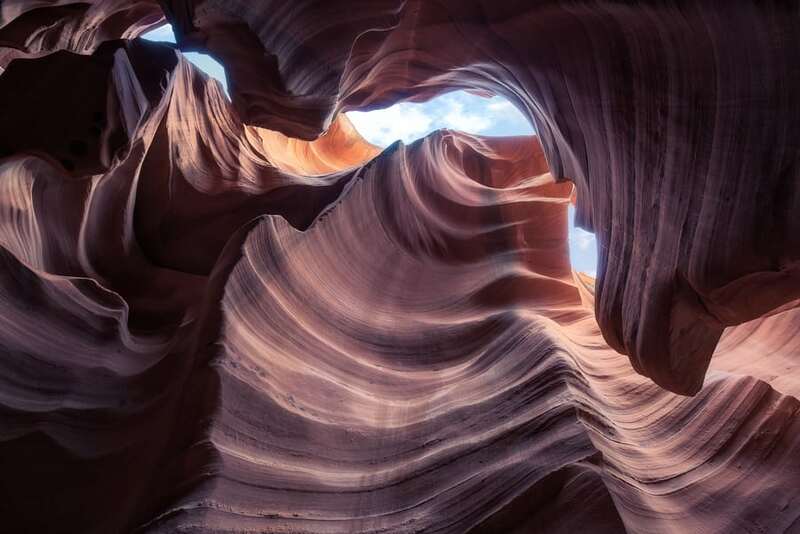 Best time to visit Antelope Canyon without tourists: From November to March. 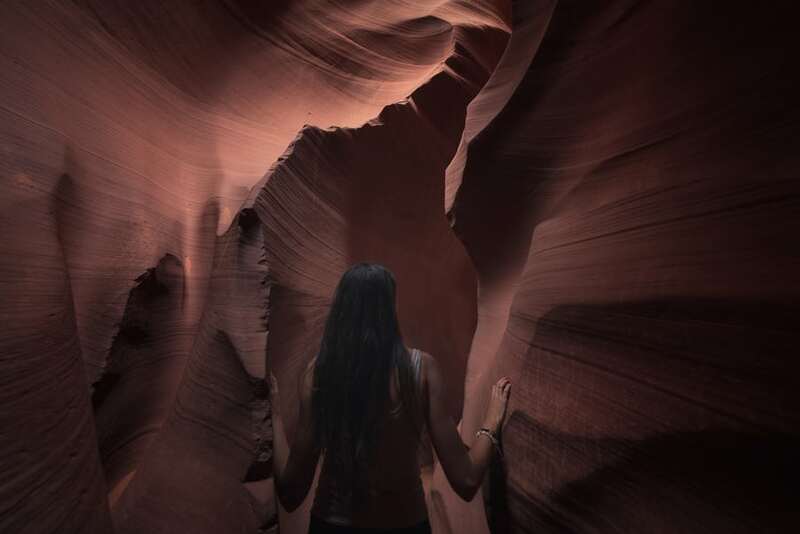 Best time to take a night Antelope Canyon Tour: All year round it is possible to take this Tour, but we will have more chances of clear skies in summer. The best months to visit Antelope Canyon are between the end of March and early October. 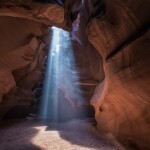 During this time, we can see light beams that enter the Upper Antelope Canyon which creates a unique phenomenon. If you visit Antelope Canyon during winter, you will miss those bright haloes. However, you would be able to enjoy Antelope Canyon almost entirely by yourself. 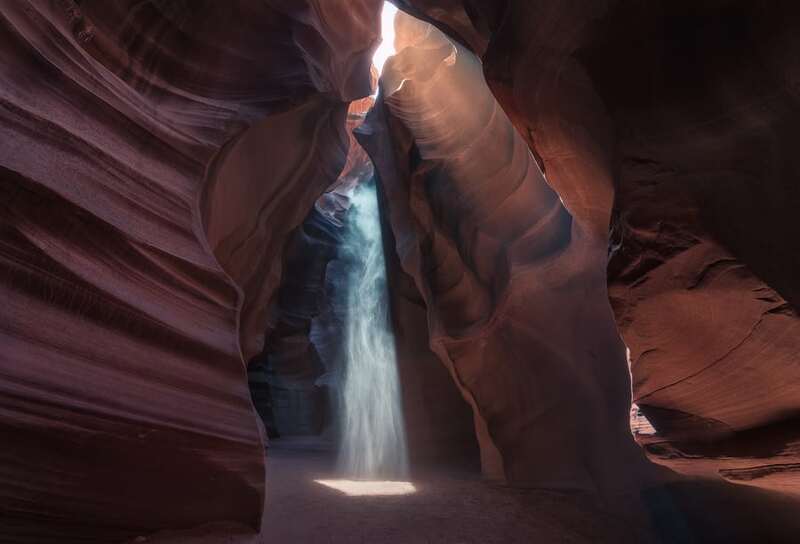 To see the light beams in Upper Antelope Canyon, you need to plan your visit during the middle of the day, between 11 AM and 1:30 PM, when sunlight is perpendicular to the canyon. There should also be no clouds during these hours, otherwise, the rays will not appear. Although many people call it Antelope Canyon National Park, it is actually not managed by the U.S. National Park Service. Same as Monument Valley, Antelope Canyon is located within the Navajo Indian Reservation, and is therefore managed by the Navajo Nation and different companies founded by Navajo Indians that offer Antelope Canyon Tours. 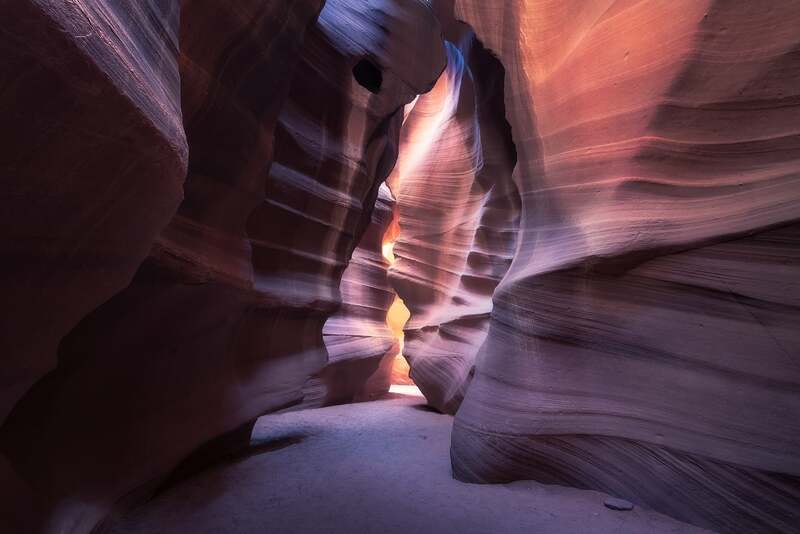 We were not very happy that you will not be able to visit Antelope Canyon without a guided tour, and on top of that, just 5 minutes of internet research will tell you how bad the service can be. But as anywhere you go, you need to adapt and abide by the local rules. In our opinion, our Antelope Canyon Navajo guides were polite at all times and did their best to help us get the best pictures of the Antelope Canyon. They do get pushy to make the tour go faster, but this is the only way to get through hundreds of tourists that visit every day. Despite feeling like a flock of sheep at some points, a visit to Antelope Canyon is undoubtedly worth it. 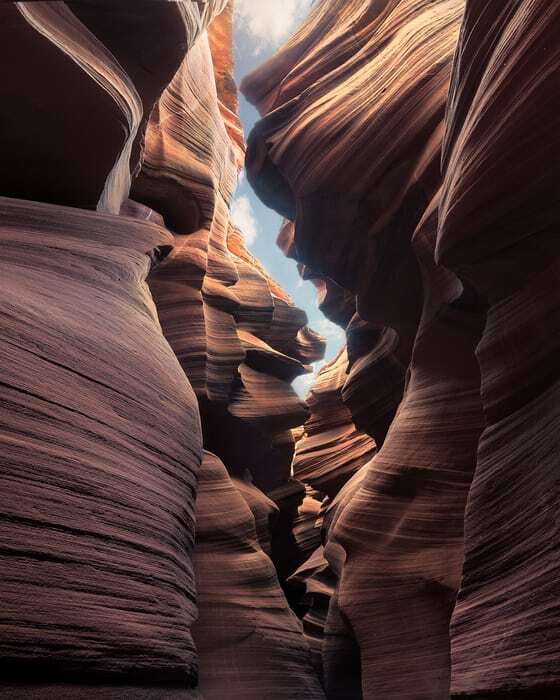 Although there are other canyons in the area, such as Rattlesnake, Owl, and Mountain Sheep, the most popular Navajo tours are the Lower and Upper Antelope Canyon tours. Upper Antelope Canyon is the most famous canyon because of the stunning mid-day light beam phenomenon that takes place in the summer months. The Upper Antelope Canyon tours are more expensive than those of the Lower Antelope Canyon, and you will also have to pay extra if you want to visit during light beam hours. To get to the canyon, you must go to the meeting point of the company with which you booked the tour (I do not recommend visiting Upper Antelope Canyon without reservation), and once there, you will be taken with your group in a 4 x 4 to the canyon mouth through a sand track. The entrance is at ground level, and you do not go down a long stretch of stairs as you would in Lower Antelope Canyon. The route is short, but you will go to and back from the end of the canyon on the same narrow two-way traffic path, sharing with people going in the opposite direction. For this reason, backpacks are not allowed during the tour. 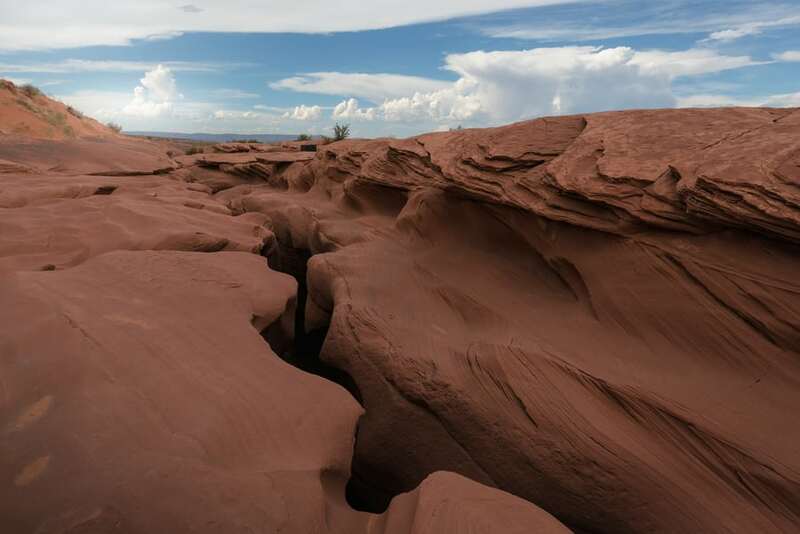 If you take the standard tour, your Navajo guide will not give you as much time to photograph the canyon as they would for those taking the more expensive Photo Tours in Upper Antelope Canyon. With the standard tour, you will have less time inside the canyon, and your guide will push harder for you to keep ahead so other groups can enter the canyon as you as you are finished. 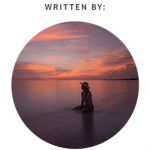 Of course, the guides will help you take good pictures with your mobile, showing you the best frames and compositions or even taking pictures for you. Cameras and tripods are not allowed on standard tours in Upper Antelope Canyon. 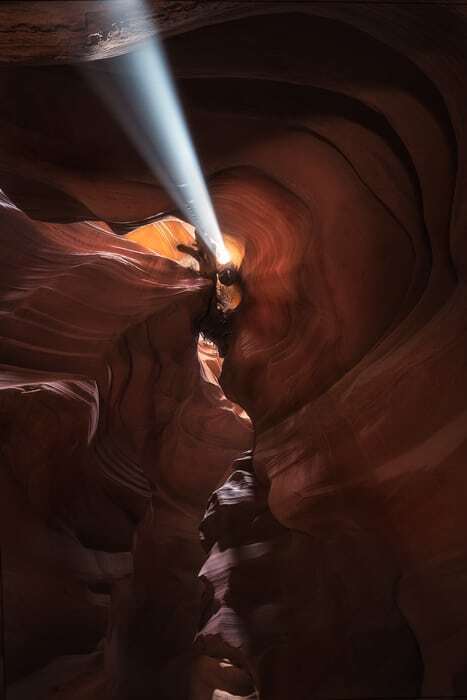 If you take an Upper Antelope Canyon photo tour, you will enjoy more time inside the canyon and be able to photograph the light beams if weather conditions align. Your guide will block other people and groups from passing for at least 1-2 minutes, which help create cleaner compositions with no people on your frame and will allow more time to shoot every main spot inside the canyon. Your guide will also give you an introductory talk at the beginning of the tour explaining the basic parameters that you can use on your camera. 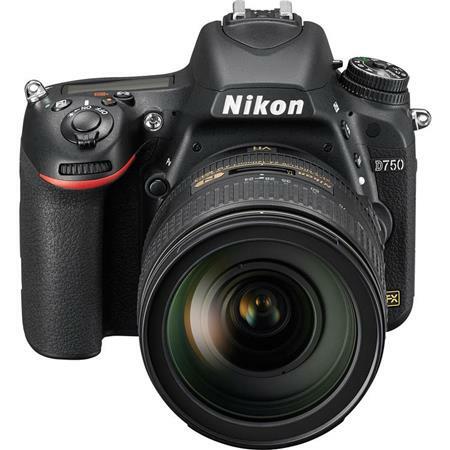 He will also provide useful information like never changing the lens inside the canyon to prevent getting dust on your camera sensor. He also provides basic tips about compositions. However, do not expect that he will personally help you during the tour. 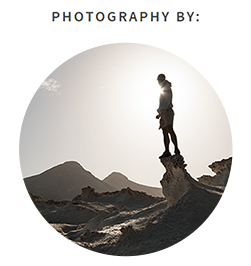 His role as a guide is mainly based on blocking people from getting into your frame, which means the pictures of your visit will depend entirely on your photography knowledge and skills. 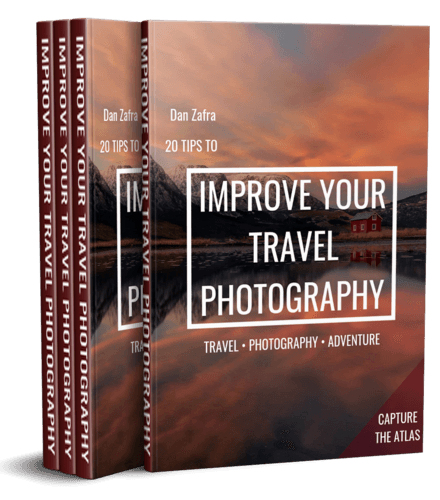 To help you in this matter, we have prepared a specific mini-guide with tips to photograph the Antelope Canyon if you are taking the Photo Tour (with DSLR or Mirrorless camera). You will learn about parameters beyond those pointed out by the guide, photography techniques, examples, and how to make the most out of your tour. 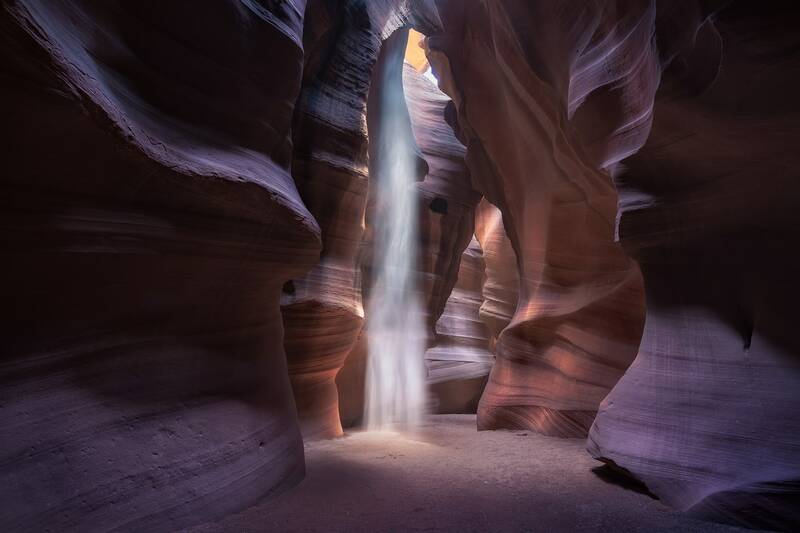 To join an Antelope Canyon photo tour, the guides will check that you have an interchangeable lens camera (Mirrorless or Reflex) and a tripod and will regroup you to a standard tour without such. 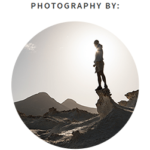 Last generation mobiles, GoPro cameras, compact cameras, gorillapods, and monopods are not accepted for photo tours. In our case, only Dani had a camera and tripod, so they regrouped me on a standard tour with my compact camera. I was lucky that there was a free spot, otherwise, I couldn’t have visited the Upper Antelope Canyon at all. More people are visiting the Lower Antelope Canyon in recent days because of its lower price compared to Upper Antelope Canyon. however, the opposite happened in our experience when entering the canyon. To get to the entrance, you must first meet your group guide at the box office. He will then take you on a small path to the far end of the canyon. Lower Antelope Canyon is carved into the ground, as usual canyons are, so you must descend a steep metal stairway that takes you to the bottom of the canyon. As this might be dangerous, the guides make sure that members of their group go down one by one which creates a significant delay at the entrance. We had to wait more than 45 minutes at the entrance until we could finally start our tour. Luckily, Lower Antelope Canyon is longer and wider than Upper Antelope Canyon, and the tour only goes in one direction. We felt that we had much more space than in the previous canyon. Although you cannot see light beams, the shapes and patterns on the walls are mesmerizing. The Navajo guides usually don’t rush here as much as they do in the Upper Canyon. 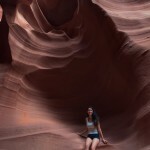 In any case, you still have to visit the Lower Antelope Canyon with a tour group, but at least they will give you a little more freedom and space to enjoy the Canyon and take your photos. ANTELOPE CANYON LOWER OR UPPER? If you do not want to spend too much money, we recommend the Lower Antelope Canyon tour. 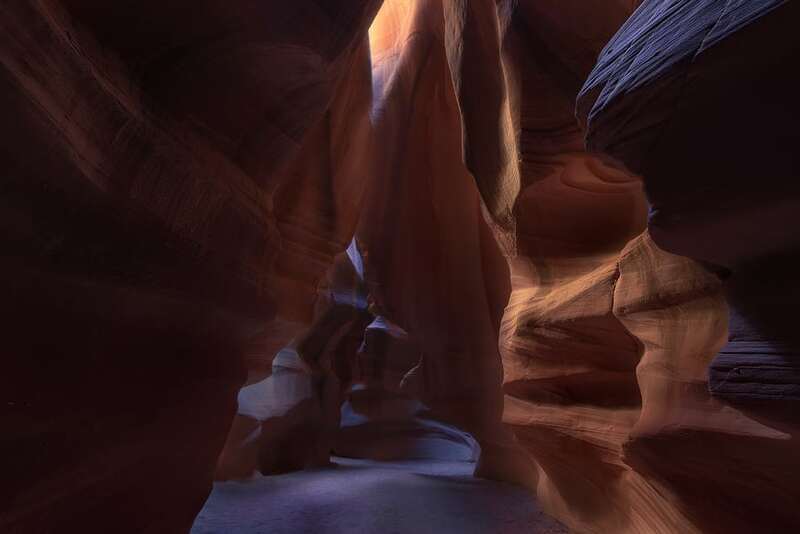 The price difference is remarkable, and you can still cross out the slot canyon experience from your bucket list. 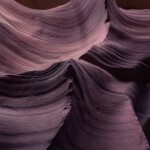 If you are interested in photography, we recommend an Upper Antelope Canyon photo tour. 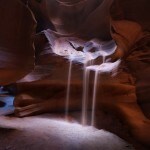 If you do not have a particular interest in photography, we think it is better to visit Lower Antelope Canyon. It will be easier for you to take good photos since this canyon is not as packed with visitors as the Upper Antelope Canyon when you take a standard tour. 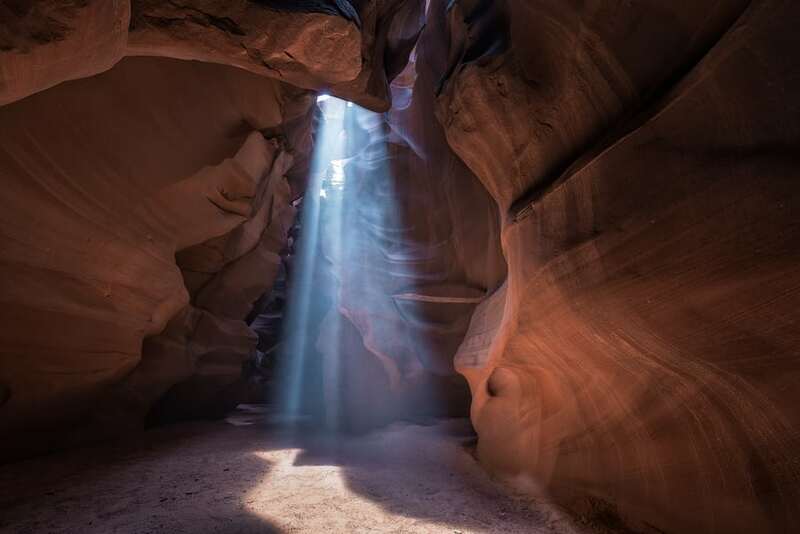 If you are going to visit Upper Antelope Canyon, it is recommended that you do it during the middle of the day when you can see the light beams. If you are not willing to pay the extra cost, we suggest opting for the Lower Antelope Canyon tour. 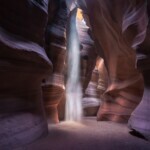 If you can afford it, take the Upper Antelope Canyon photo tour and visit Lower Antelope Canyon. And in any case, whichever you visit, Antelope Canyon is worth it! 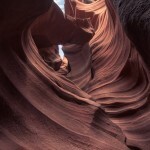 As we explained above, it is very difficult to visit Antelope Canyon without a reservation. 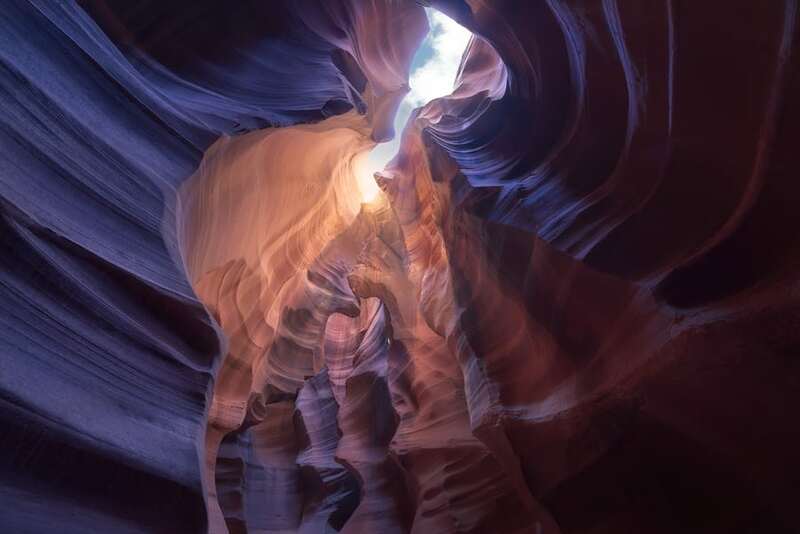 In this section, we will talk about the cost to visit Antelope Canyon, schedule of the tours, and where to book your Navajo Antelope Canyon Tour. HOW much does it cost to visit antelope canyon? The Navajo Indian Reservation sets the Antelope Canyon entrance fees, so all companies that offer Navajo guided tours to Antelope Canyon will be priced the same. In addition, you have to pay for an $8 permit to enter the Navajo Nation. As the price of the tours in Antelope Canyon are the same among different companies, we recommend that you choose according to schedule instead. Antelope Canyon schedule vary depending on the company you book your tour with. The duration of the Antelope Canyon tour is 1.5 hrs. for the standard visit to Upper Antelope Canyon, 2.5 hrs. for the Antelope Canyon Photo Tour, and 1.5 hrs. for the Lower Antelope Canyon tour. 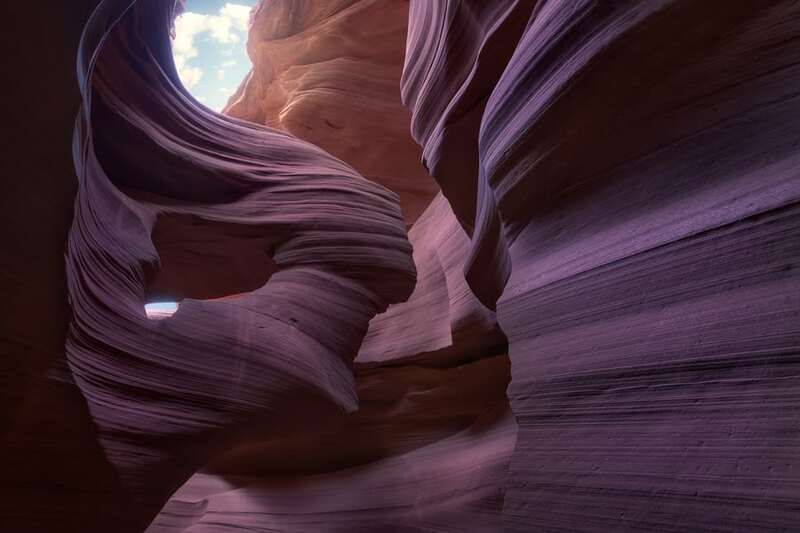 When buying tickets for Antelope Canyon, do it through each of the previous websites. I recommend booking the Antelope Canyon tours well in advance, especially in the summer. 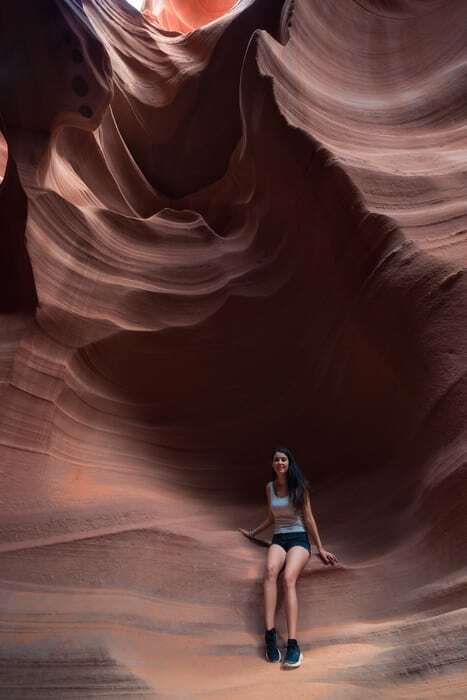 If you didn’t make any reservation, I suggest trying your luck in Lower Antelope Canyon, as it is more likely that you find a last-minute spot here than in Upper Antelope Canyon. Another option if you don’t have a reservation but have an interchangeable lens camera and a tripod, is to try to get a spot in the Upper Antelope Canyon photo tour, as they often regroup visitors without proper photography equipment to standard tours. You can visit Lake Powell after exploring Antelope Canyon. We went to the Antelope Point Launch Ramp, and turned right from there until we reached a parking lot used by those who want to go to the small beach for a swim. On the way, you’ll find a Navajo Nation Parks box office, where you will need to pay the ticket entrance. I do not remember how we managed to enter without paying for that particular ticket, whether it was because we had already paid the Navajo fee in Antelope Canyon or if it was because we had the annual America the Beautiful pass, but you shouldn’t have any problem with either tickets. 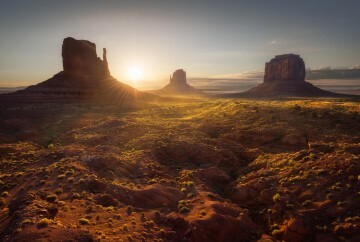 The Navajo Nation is independent of the US National Park Service. However, Lake Powell is within Glen Canyon National Park, so I do not remember which of the two organizations managed this section of Lake Powel. To see Antelope Canyon by boat, you can take a tour that leaves from Lake Powell. These tours depart from the Antelope Point Marina visitor center. The Upper and Lower Antelope Canyon start at this section of the lake, and it narrows very similarly to the Antelope Canyon. Similar tours are also offered at another area of the lake, where Wahweap Marina in the Lake Powell Resort is located. If you want to visit Antelope Canyon by Kayak, there are also companies that either organize kayak tours through Antelope Canyon or rent kayaks for you to visit areas of the lake that you prefer. Some of these companies include Powell Kayak, Lake Powell Hidden Canyon Kayak o Lake Powell Paddle Boards among others. 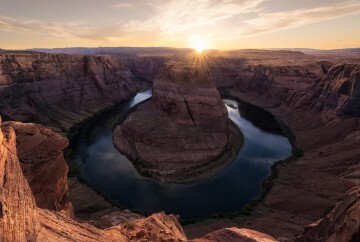 Without a doubt, one of the most exciting tourist attractions near Antelope Canyon is Horseshoe Bend. 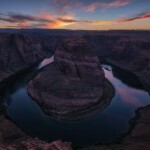 For thousands of years, the Colorado River has been carving out the horseshoe-shaped, over 980 feet deep canyon. It is one of the most visited attractions in Page. In addition, Antelope Canyon and Horseshoe Bend can be visited on the same day – Antelope Canyon in the morning, and Horseshoe Bend for sunset. 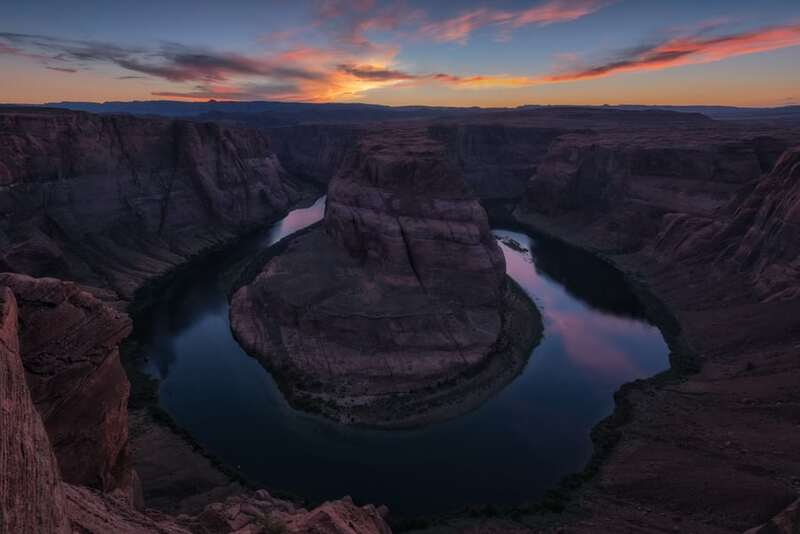 Since it’s one of the most stunning locations of our trip to the West Coast, we wrote a specific article to give you all the information necessary to visit Horseshoe Bend. And we could not miss a section on cheap accommodation near Antelope Canyon. If you want to go camping in Antelope Canyon, I recommend Page Lake Powell Antelope Canyon Campground that has both tents and RV options. Hyatt Place Page Lake Powell: This highly rated hotel is located in the center of Page. Since the town is small and touristy, you will have to book well in advance as the rooms fill up quickly. Country Inn & Suites by Radisson: Without a doubt the best hotel in Page, both the price and the rooms. It is not centrally located in Page but is located closer to Horseshoe Bend. We wanted to leave this section at the end to give you some extra tips for visiting Antelope Canyon that we have not included before. All attractions within the Navajo Indian Reservation include a fee for the maintenance of the reserve. This fee is $8 per day, but you could be charged multiple times if you don’t mention that you had already paid the fee at another attraction. 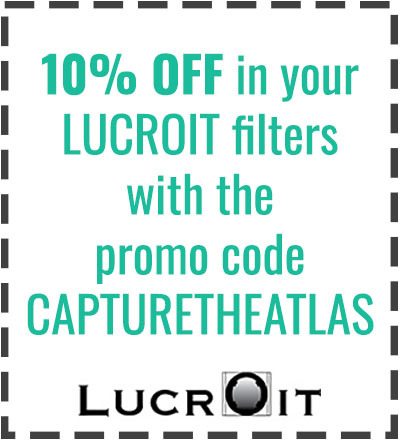 Best way to go about it is pay for the first activity, and then show the voucher on the rest of the activities where they will then discount this fee. For example, make sure you only get charged once when you visit Upper and Lower Antelope Canyon. 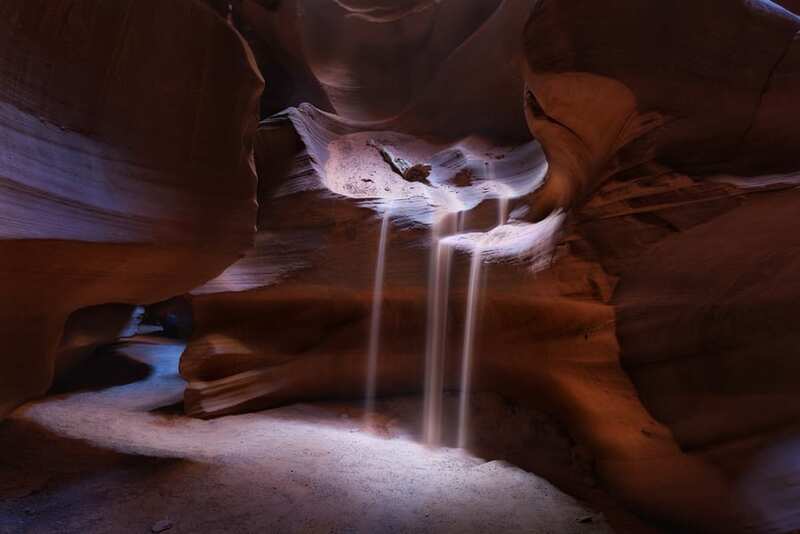 Although Antelope Canyon is in an arid region, flash flooding can occur when it rains. Such flooding in Antelope Canyon can be very dangerous, as the walls are narrow and many people are usually inside the canyon. Typically, your guides would cancel tours if there is heavy rain forecast, but it is always good to check the weather forecast if you plan to visit Antelope Canyon without a reservation. 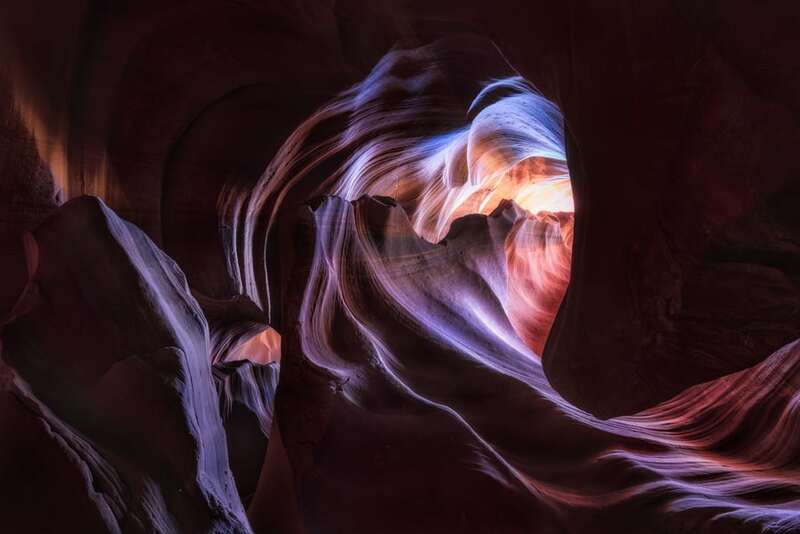 The most serious incident took place in 1997 when a strong storm created a 19-foot wave in Lake Powell that traveled into Lower Antelope Canyon, taking 11 tourists with it. All were dead and two bodies were never found. The guide survived as he managed to climb up the canyon. 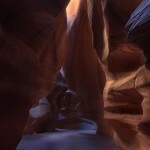 Since then, access to Antelope Canyon without a guide became forbidden. If your tour is canceled because of rain forecast, you can understand the real reason. At this point, you should have all the Antelope Canyon information you need to enjoy your visit. 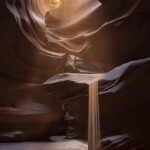 You can find our best images of Antelope Canyon below. 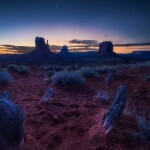 Some of the photos were taken at Upper Antelope Canyon and others at Lower Antelope Canyon. Infinite Sandclock - Antelope Canyon. United States. We were incredibly impressed by this natural creation in Arizona, and I encourage you to include Antelope Canyon on your list of photo tours along West Coast US. With this map of Antelope Canyon and surroundings, we bring this article to an end. 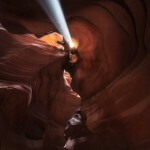 We hope this help make your visit to Antelope Canyon an unforgettable one! Wow! 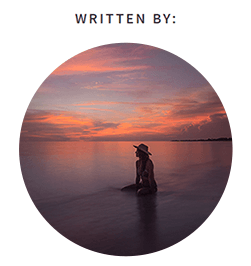 Congratulations to these pictures, they’re breathtaking! We’ve just passed the canyon and even though we would have loved to take pictures like these, after a little research we decided to skip it. Really sad that such a beautiful place is so overrun. And charging 151$ for someone bringing a camera and then chasing him/her through this place anyway is rather exorbitant in our opinion. But obviously, everyone needs to decide for themselves! Thank you very much for your comment Doris. I had already pointed Spooky Canyon on my map of places that I want to visit, but I hadn’t heard about the Peek-a-boo canyon before. I understand that it is not the same trail that has the same name and starts at Bryce Canyon National Park, right? Any other place you can share with us will be more than welcome. 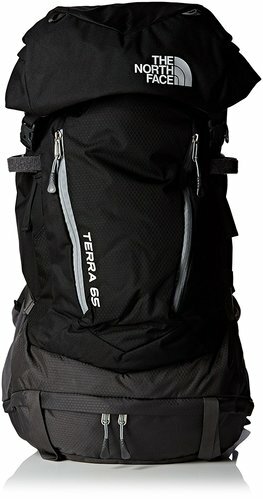 Is it acceptable to visit Lower Antelope Canyon carrying a back pack? How big is it? I don’t think it is a problem if it is small. Canyon X is another section of the same Antelope Canyon so it may be as amazing as the most crowded upper and lower. We didn’t visit it but it should be a good option too and less crowded so go ahead and come back to let us know how was the experience. Hello! Thank you the information. If pressed for time, is it advisable to visit both Upper and Lower, or one over the other? I’ve read Lower is less crowded? In the photographer tour, do they allow you to take pictures with people in it? I only see pictures of the rocks itself. 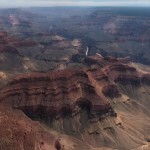 In the Photo tour, the guide stops at the main highlights of the Canyon and keep other visitors from entering the frame. All the photographers will be in line by your side, so it is not supposed to be a tour to take pictures with people on it. During my tour, our group was exceptionally small (just 3) and at the end of the tour, we agreed to take a picture of ourselves, but that it is not something common. 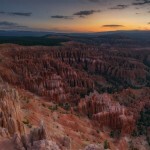 What is the best time to visit the Upper/ Lower Canyon? Is it allowed to take a camera and take pictures of my friends for example? or is there any rules regarding taking this? The best time depends on what you are looking for and the tour you are taking. If you want to see the light Halos in Upper you should go during the summer. All this is explained throughout the article. If you are taking the normal tour, you can perfectly take pictures of your friends with your smartphone. Please bear in mind that the canyon is usually crowded in the normal tour, so taking pictures without people is a real challenge. 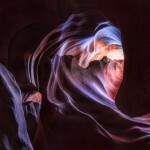 I haven’t visited that Slot canyon yet but it looks very interesting, especially to avoid the crowds. Thanks for this great article! I have a question regarding the Navao fee. As far as I’ve found you have to pay in advance to book these tours, and both of them include the Navajo fee by default. How can you avoid paying the fee twice in those cases? Or do they give back the amount in cash when you show them that you have already paid this for another tour? Thank you very much for your comment. You are right, they include the Navajo fee by default. What we did was purchase the Upper and Lower tours and sent a request to the Lower tour to be reimbursed for the Navajo fee (send them a copy of your Upper tour so they can check you have already pay the fee).